I had a fantastic trip late in 2003, as the guest of a small group representing some of South America’s finest wine producers, and their UK Agency, Bibendum Wine. This was my first trip to the wine-producing heartlands of Chile and Argentina. Over my 10 days there, and with several thousand kilometres of internal travel, I gained a far better understanding of the landscape and climate that shapes these regions, their different soils and terroirs, and the unique challenges and opportunities facing the grape growers and winemakers. Vine growing in Chile is confined to a fairly narrow horizontal section through the centre of this incredibly long and thin country. To the north begins the Atacama dessert; the world’s driest place and a wilderness area. To the south the Chilean Lake district is a land of geological wonder (and most definitely on my plans for a future trip) before the Patagonian ice fields and a freezing land of brilliant blue glaciers. It soon becomes obvious why that narrow middle section is the only possible option for grapevine cultivation. With 6,000 kilometres of Pacific coastline to the west, and the snaking spine of the high Andes mountains forming the border with Argentina to the east, Chile is a natural fortress. 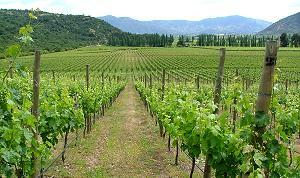 The vineyards are mostly in the Central Valley, running north-south between the Andes and the significant, if less impressive, Coastal range. The Andes are the main source of fresh irrigating water, as well as providing cooling air in the evenings. The Humboldt current, racing up from Antarctica, is equally important in creating Chile’s dry, almost Mediterranean climate. Sunshine hours are not a problem, though frost can be a danger in Spring months. Travelling south from the capital Santiago on the Chilean section of the pan-American highway is a bit of a culture shock. The highway is Chile’s main motorway artery, yet we pass cowboys on horses, and a family of children staring forlornly from the back of an overcrowded buggy pulled by a donkey. Perhaps it is the tiredness of 24-hours of travel, or the Kunstmann, a strong local lager that washed down a quick sandwich lunch, but as I drift off to sleep in the back of our car, I have a definite sense of being far from home. For the first leg of my trip I am staying with Jorge Coderch at his stunning estate “Chilcas” in the Maipo region, a couple of hundred kilometres south of Santiago. Jorge is a big, powerful, whirlwind of a man, who’s nickname of “crazy horse” suits him perfectly it seems. 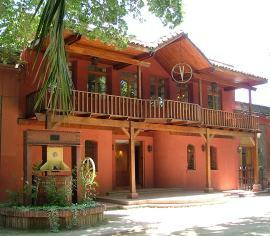 Indeed, the wine Jorge made at Valdivieso was named after him, “Caballo Loco”. George remains on the board of Valdivieso and is deeply involved with the wines made there, but we are here to find out more about Via, his new project, and one that is obviously a burning passion for him. Jorge has a relentless drive and enthusiasm. He admits to sleeping only three or four hours per night, and ideas pour from him like a torrent during my few days staying on the Chilcas farm, the hub of Via’s impressive operation.Via is a Chilean wine name you probably do not recognise, yet it is one of the hottest names around on the Chilean scene, and represents a radical departure in a wine industry that is somewhat traditional by and large. Jorge began his search for a new wine estate and a brand new project a decade ago. His vision was for a modern, commercial wine operation that would be totally market-driven; capable of producing quality wines to satisfy any client, and any market. This ambition was really quite revolutionary in the slightly staid, traditional world of most Chilean wine producers. The Via Logo includes the Greek symbol for infinity, suggesting their nine vineyards spread across four of Chile’s prime regions, equips them to offer wine “solutions” in a globally-focused operation. Via is clearly not an artisanal operation, but it is already meeting with considerable success, producing all of Tesco’s own-label Chilean wines.On day two we took a two hour horse ride around the Chilcas estate, riding through streams and between rows of vines, with the backdrop of the Andes framing every view. Chilcas is a large estate by Chilean standards, and Jorge spent almost half a million dollars satellite mapping every square inch of it, before planting a single vine. Working with scientists from UC Davies in California, his aim was to maximise every slope and soil type for the specific vine clones he would plant. Already, several hectares is certified organic, and the plan is to run the whole estate organically as soon as possible. Visionary though he may be, Jorge shows his shrewd business sense in that part of the farm is given over to 4,000 head of beef cattle. In a very natural symbiosis, these beasts provide an ample source of one of organic farming’s key ingredients, free of charge. Winemaker for Via is Julian Grubb, a young Englishman who started his wine career as an assistant at Oddbins in Oxford. The path he followed from there included gaining an honours degree in Oenology from the University of Adelaide (winning the Leo Buring Gold Medal for top oenology student), and winemaking stints in Australia, South Africa (Thelema), Spain, France, California (Ridge), Argentina, the Czech Republic and Italy. Clearly he has been exposed to a variety of winemaking philosophies and styles, and his shy, calm demeanour belies a steely determination to do things they way he wants. Certainly the results are impressive, with a portfolio of balanced, very characterful wines. On Sunday morning we took a two-hour drive by 4X4 to the foothills of the Andes, 100km north-east of the town of Talca, to the Siete Tazas national park. 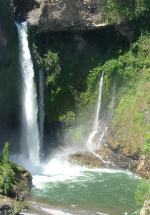 This huge trekking area into the Andes is named after the “Seven Cups” waterfalls, formed by the Rio Claro river’s erosion of the basalt rock in the park. We took a four-hour hike, most of that way being vertical, spotting condors and eagles, but thankfully no pumas which are plentiful. At the end of the trek we tumbled exhausted into La Flor de la Canela, the park’s only accommodation and restaurant, which from the outside looks like a tumbledown shack. What a joy to discover that inside is a warm welcome and excellent home cooking, with fruits and vegetables grown by the owners, and baskets of wonderful warm flat bread served with bowls of Chancho en Piedra, a deliciously spicy, coriander (cilantro) -based salsa. Over dinner that night I spoke to Julian at some length about the Chilean wine industry, and was impressed by the list of inward investors into the country’s wine scene, from Italy’s Antinori, to California’s Kendall-Jackson, to William Fevre and Michel Laroche of Chablis. The scene here is definitely changing fast, and whilst go-ahead forces like Jorge Coderch have an influence, the potential is there for Chile to consolidate its reputation for good value, well-made wines at one end of the scale, whilst expanding its horizons in terms of both export volumes and quality. Next morning I was collected by export managers JP Roeschmann and Christian Sotomayor of Valdivieso, and we set off for the drive north towards Santiago. Our first stop was in Lontue, to visit Valdivieso’s important Primavera vineyard site. Valdivieso is the fourth biggest producer in Chile, and I had a fascinating walking tour of this large site, from the valley floor (“our £4.99 vineyard” according to Christian), climbing to the slopes of the Coastal mountain foothills (“our reserva level vineyard”). This was a chance to see the juxtaposition of new and old in Chilean vine-growing. 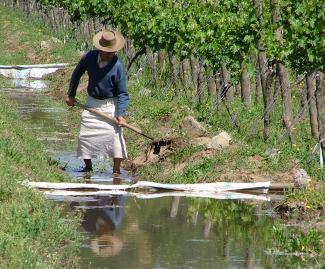 The older vineyards use flood irrigation, with water draining off the mountains. The painstaking job of opening up the flood channels, basically by digging out and refilling dams made with mud at the head of each row of vines, is today replaced by drip-irrigation. At the top of the vineyards, blasting and clearing of rock was on-going, to create new sites.I awoke next morning to a stunningly beautiful day in Santiago, where breakfast on the 21st floor terrace of my hotel offered panoramic views of this city. Against an amphitheatre of the Andes, it is a lovely city, with broad Colonial streets and mansions, and parks and gardens everywhere. There is obvious investment too, with a new seven kilometre highway being constructed underground, creating a badly-needed north/south artery. There are also no less than three new lines being added to the Metro system. We travelled to Valdivieso’s HQ and sparkling wine cellars in the heart of the city. 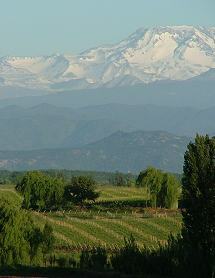 Valdivieso produce 60% of all sparkling wine in Chile – it is a huge business. Most is inexpensive tank method fizz, but 20% is very good quality Champagne method from Pinot and Chardonnay. There was also a delightful product not in the UK, made from sparkling Pinot and fresh strawberry pulp. But it is Valdivieso’s still wines which drive their export market, through head winemaker Brett Jackson, a New Zealander who is doing great work.Brett had led us through barrel tastings in the Lontue winery the day before, and now we had a more formal tasting of the bottled 2003 whites and 2002 reds. Both tastings were truly impressive. I am a long-standing admirer of the wines of Valdivieso, but I had felt the company was rather treading water at the turn of the millennium, letting other dynamic producers like Concha y Toro and Errazuriz steal a march. However under the quietly-spoken but determined guidance of Brett Jackson there is a renewed sense of quality and ambition throughout this portfolio. Brett is even setting up his own fine wine micro-winery, being constructed within one of the huge storage sheds of Valdivieso. Here, open-topped fermentation vats have replaced the huge stainless steel tanks, and Brett will use wild yeasts, hand-plunging of the skins and slow fermentations on a new range of prestige wines. He allowed us to taste the Malbec and Cabernet Sauvignon components of a blend that is destined for a new £20 range. The first vintage will be 2002, released later this year, and tasting pretty sensational from barrel (all tasting notes will follow in part III of this report).At the fighting-weight £4.99 level, Valdivieso’s Chardonnay and Sauvignon Blanc are about as good as I’ve tasted in the price range, and Brett has also inherited the responsibility for Caballo Loco, one of Chile’s first icon wines. Caballo Loco is a non-vintage, multi-regional, multi-grape blend that is shrouded in mystery as to what exactly is in the bottle. Released every year simply as “No, 1”, “No. 2” and so on, Brett’s first production – No. 6 – is an absolute beauty. I asked Brett if he could tell me exactly what is in it (a closely guarded secret), but he said he honestly doesn’t know: Caballo Loco is made by a solera system of fractional blending, with a base of Cabernet Sauvignon, and bits of Syrah, Merlot, Cabernet Franc, Carignan and others. No. 6 contains a portion of No. 1, and every Caballo Loco since, in the blend. We took lunch in the boardroom of Valdivieso, a wonderful showcase of Chilean ingredients, including beautiful Patagonian lamb, King crab with Quinoa, a cous-cous-like grain, and Lucuma ice cream. Lucuma is a fruit that has basically no juice, but the pulp is used in desserts. It was a delicious taste, somewhere between avocado and almond. My last dinner in Chile was brilliant too; sophisticated seafood in a downtown restaurant, complete with Riedel glasses, Illy coffee, and all the best of modern International cooking. These two producers, one with over 100-years of history, the other less than a decade old, sum up the potential of the Chilean wine industry. Valdivieso is a family-run, Chilean company with long-established roots in their community, whilst Via is a brand-new enterprise with global investors and determinedly market-led ambitions. Both are capable of utilising the almost unique bounty that Chile has to offer; naturally disease-resistant vines, long-established vineyards, and a wonderful climate.The competition facing Chile in the global wine marketplace is fierce, from both New World and Old, yet this trip and the generosity and pride of the Chilean wine people I met, suggests they are up for the challenge. One thing is sure, producers like these will not be resting on their laurels over the coming years.